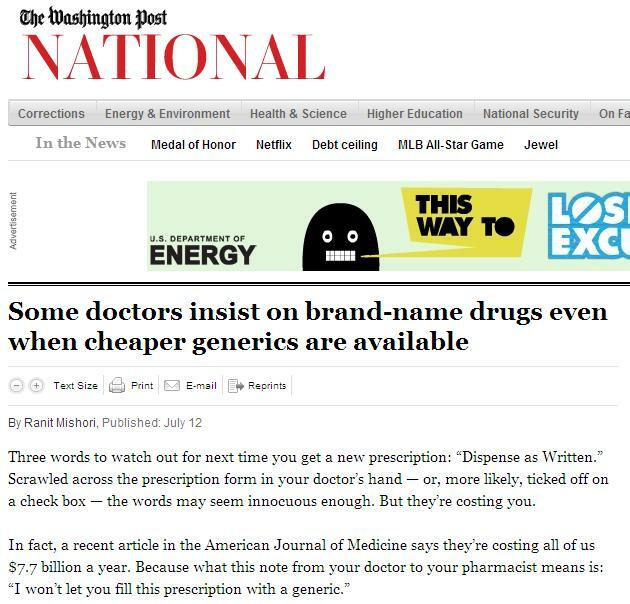 There was an interesting but controversial article yesterday in the Washington Post written by a physician, Dr. Ranit Mishori, Some doctors insist on brand-name drugs even when cheaper generics are available. Dr. Mishori quoted the American Journal of Medicine article where "researcher doctors noted that out of a sample of 5.6 million prescriptions written for more than 2 million patients, nearly 5 percent “were designated as dispense as written by physicians and patients.”"
So why do some doctors prescribe a brand-name drug when a generic is available? Researchers report that many doctors still don’t trust generics. In one recent survey, published in the Annals of Pharmacotherapy, nearly 50 percent of the doctors participating acknowledged holding some negative perceptions about the quality of generic medications. On the first paragraph, I think Dr. Mishori did not mention some considerations by physicians, pharmacists and pharmacologists before they would recommend drug switching to any generics equivalent -- bioequivalence, pharmaequivalence, cGMP, etc. The same drug, patented or generic, branded or non-branded, by the same manufacturer given to two patients with the same disease may produce different results. This is because although they have the same disease, the two patients have different biological and physical conditions (one is older than the other, or one has diabetes or hypertension while the other has none, and so on). On the second paragraph, both innovator and generic manufacturers are doing those things -- giving free drug samples, mugs/pens/USB/bags with the name of the drug or manufacturer. In the Philippines for instance, the biggest advertiser of drugs are not any of the multinational innovator companies. It is Unilab, the biggest pharma company here, it is a local and generic manufacturer firm. One can see Unilab's products on tv, newspapers, billboards, pens, and so on; hear it on radio, etc. I reiterate that we do not discount the importance of generic drugs to patients and to the healthcare system as a whole. However, let’s not forget that without innovative brand medicines, there would be no generics. Today’s groundbreaking medicines will likely someday find their way to patients as generic options, as well. But at the end of the day, if we rely solely on generics, innovation will stagnate. The future of medical progress lies not just in generic drugs, but in brand-name medicines. I agree with her observations there. Both innovator and generic drugs are important, they have their uses to patients and their physicians. Where drug switching is allowed by our physicians, then let us go for generics, they are cheaper and safe at the same time. But some patients are more impatient than others, they want to get well soon; not next month or next week, but the next 2 or 3 days. They want more powerful, more disease killer drugs, even if these are more expensive than those currently available. And that is the role of continuing drug innovation. Well, at least Dr. Mishori did not advocate in her article the abolition of patent and IPR system in drugs, unlike what the socialists and some libertarian anarchists would suggest. * On a related note, here is a recent article by the Executive Director of the Pharmaceutical and Healthcare Association of the Philippines (PHAP, www.phap.org.ph) on the importance of medicines innovation. Innovation, which came from the Latin word innovatio, means “to renew or change.” It is an important concept in design, technology, business, engineering, politics and sociology. For the pharmaceutical industry, innovation means continuous research and development to produce more efficacious and better targeted medicines for patients around the world. Pharmaceutical innovation has become more challenging, risky, time-consuming and expensive in recent years. But the fruits of the labor are worth it. Breakthrough medicines are being discovered to address serious diseases such as cancer, heart ailments, osteoporosis, Alzheimer’s and HIV-AIDS among several others. The results are more than encouraging with more people living longer and healthier these days. Innovation to strengthen health systems around the world is an equally complex and challenging task but that which yields positive results. Recently, the Philippine Institute of Development Studies and the Center for Health Market Innovations (CHMI) launched a search for outstanding health market innovations in the Philippines. The innovations under consideration are programs by both public and private sectors that aim to address quality, affordability, equity and availability of health care. The project intends to recognize innovative practices that reduce or eliminate the barriers to poor’s access to health care. For a health market innovation program to qualify, it must have used appropriate technology that was able to overcome institutional problems of the health sector. The program must be able to demonstrate that it reduced fragmentation in service delivery, addressed capital constraints in investments and increased efficiency in operations. The health innovation must have likewise created an impact by achieving sustainability or would have prospects for replicability or scalability. For example, the program must not be limited by geography, cultural practice, charisma of the leader or any other non-replicable characteristics. The project must also be pro-poor. The health innovation must be able to increase access to health care for people who are financially constrained, socially excluded or geographically limited. Finally, the health innovation project must be innovative. This means that it must be “interesting, exciting, pioneering, path-breaking, trailblazing and bold.” The project must also have a ripple effect if it gets to be known more. Once a master list of health innovations in the country has been compiled, CHMI will add them to their growing database that contains other model projects from several other countries. All the programs that are in the database will serve as a global resource that will showcase programs that actually improve the quality and affordability of health care for the poor in countries with many private providers. Nominated as a health market innovation was the Code of Pharmaceutical Marketing Practices, also known as the Code of Ethics, which was developed by the Pharmaceutical and Healthcare Association of the Philippines (PHAP). The nomination of the Code as a health innovation is both a milestone as well as a recognition that PHAP members who all strictly abide by the guidelines are on the right track. In a highly competitive business environment, PHAP has long established the Code of Ethics which aims to require its members to adhere to a set of guidelines. The Code of Ethics ensures that all pharmaceutical companies belonging to PHAP are aiming to preserve the independence of health care professionals in prescribing medicines to patients. It is being monitored and implemented by a committee composed of non-industry members who are highly respected experts in the fields of ethics and governance. Apart from the Code of Ethics, a number of programs were also deliberated on by a panel health experts. Among the programs which received high marks were insurance programs under the Philippine Health Insurance Corp. including its Kalusugang Sigurado at Abot Kaya sa PhilHealth Insurance (KaSAPI) Program which aims to increase enrolment among informal economy employees, a group critical to achieving universal health care. Another program was that of the University of Philippines Telehealth Center which has hatched several innovative programs to bring quality health advice and services to people in remote areas, such as the Community Health Information Tracking System, the Tarlac Wireless Access for Health, and BuddyWorks. Another health innovation which figured during the deliberations is the one introduced by The Generics Pharmacy, a PHAP member. According to members of the expert review panel, the scheme has captured the low income group and enabled the establishment of profitable rural pharmacies with low capitalizations. Innovations that protect the health of the poor are truly important in a country which as one report indicated, has 32% of its people living below the poverty line. Innovations particularly in health care are becoming important tools in achieving better health for Filipinos. For more information, consult your doctor or you may log on to www.phap.org.ph orwww.phapcares.org.ph. Join us on www.facebook.com/people/Pharma-Phap/. E-mail the author at reiner.gloor@gmail.com.